Sometimes it is the more subtle, less obvious features provided by tools which prove to be surprisingly useful. Interestingly, while such features can save developers considerable time and effort, they are often much less apparent, and thus, occasionally overlooked when compared to their main counterparts. A noteworthy example of some very simple, yet extremely useful features can be found in just a few of the basic Chrome Developer Tools shortcut keys. Below is a brief description of the most convenient shortcuts I find myself using regularly. There are quite a few additional shortcut keys available in Chrome Developer Tools, and Jared has done a excellent job of providing a Devtools cheat sheet. I highly recommend trying some of them out; committing to memory those which you find most useful – and sharing them with others as well. Recently, while preparing a training session on HTML5 Semantic and Structural Elements, I was rather intent on conveying the importance of an application’s overall markup and structure, while also expressing the importance of not being overly concerned with the absolute technical “correctness” of each and every element used. 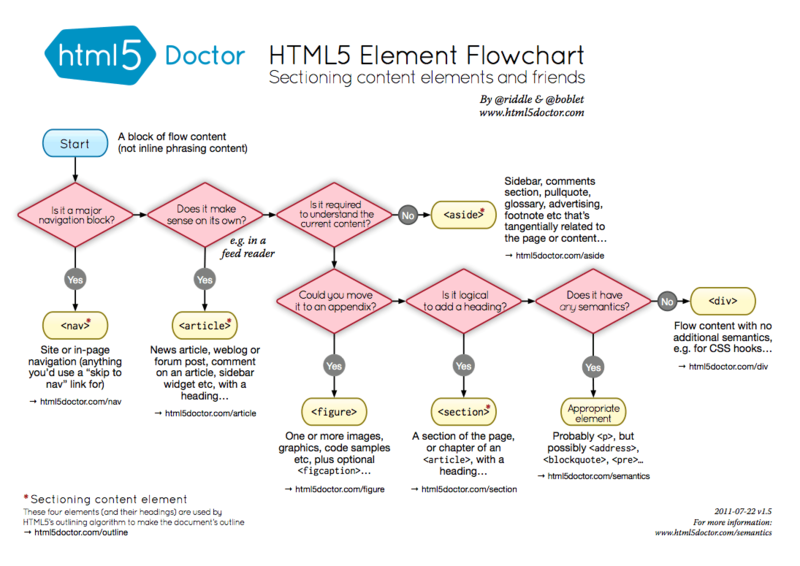 With this in mind, providing a general overview of HTML5 sectioning content, and HTML5 Document Outlines, seemed appropriate points to emphasize. Before doing so, I was looking to utilize a simple utility to provide a means of visualizing an HTML5 Document Outline, and the very useful Chrome Extension, HTML5 Outliner, proved to be an ideal tool for the task. In particular, the HTML5 Outliner is quite helpful in validating the overall structure of single page web applications, whereby the constructed page is based on multiple disparate client-side templates being rendered at runtime; in which case it can be rather useful to have a holistic view of an application’s structure. And so, if you are building modern client-side web applications, and using Chrome, if you haven’t done so already, I certainly recommend installing the HTML5 Document Outline for quickly viewing an application’s overall structure. Recently while viewing the documentation and source for Lo-Dash, I noticed an interesting Github feature which allows for linking to any line number within a source file, and highlighting the line when the page is loaded, via URL anchors. To link to a specific line of code in a source file on Github, simply click on the line number, which updates the URL with an anchor to that particular line number, or manually append an anchor to the URL in the form #L<line-number>. For example, here is a link to the EventRegistry in the Backbone.EventBroker. After discovering this interesting little feature, I tried out a few other things and found that a block of code can also be anchored to as well, allowing for the block to become highlighted when the page is loaded. Creating an anchor to a code block is as simple as selecting a line and pressing CTRL+SHIFT while selecting another line. Alternately, the line numbers can be manually added in the hash by specifying start and end line numbers in the form #L<line-number-start>-<line-number-end>. For example, here is a link to the EventBroker.get method. Since source files are likely to change with each commit, it is important to be mindful of the potential side effect of linking to specific line numbers. This is necessary for the obvious reason that changes in source could result in links to line numbers which no longer correspond to the expected code. That being said, the ability to link to a certain line in a source file is still a rather cool and useful feature, even if only used for sharing links quickly, or for linking to specific commits which are unlikely to change. When leveraging the utilities provided by Underscore or Lo-dash, determining if an Array, String or Object is empty is quite simple via the isEmpty() method. In the context of an Object, it is important to keep in mind that _.isEmpty() is implemented such that it determines an Object as being empty in a literal sense. That is, objects are traversed to determine the existence of any own properties – irrespective of their actual values. Thus, _.isEmpty() will return false if an object contains any own properties, even if all property values are undefined, otherwise it will return true. While these details may seem obvious, it is important to be mindful of them in order to avoid potential false positives when trying to determine if an object’s properties are all undefined. Technically, the above object is not empty, as it contains two own properties. Thus, invoking _.isEmpty() with this object will return false, which is correct, though one may have mistakenly assumed it to have returned true since all of the object’s properties are undefined. * which case the object is considered empty. The ease with which libraries such as Underscore and Lo-dash allow for adding extensions and overriding default implementations is a key design feature which makes them not only extremely flexible, but also quite enjoyable to work with as well. When developing single page web applications, patterns of structure, organization and reuse become ever more important. This especially holds true when there is a need to maintain mulitiple web applications, each of which targeting a specific form factor, while also sharing many of the same underlying core APIs. In the context of client-side templating, such patterns begin to emerge, quite naturally so, when leveraging RequireJS modules and the RequireJS text plugin. One specific pattern I have found myself implementing is that of a single Templates Module which provides a centralized location from which all compiled templates within an application can be referenced. A rather simple pattern, Template Modules are only concerned with loading, compiling and providing a public API to access compiled templates; that is, a Templates Module simply requires all external templates, and provides named methods for retrieving the compiled template functions of each. The main benefit of implementing a Templates Module is reuse, as different modules can use the same templates without a need for redundantly requiring and compiling the templates themselves. Additionally, Template Modules provide a convenient means of abstracting away the underlying template engine from client code, thus reducing the amount of refactoring needed should the template engine itself ever need to change. When using the RequireJS Optimizer, each external template will be included in the optomized build and loaded synchronously, and so there is no additional overhead in terms of HTTP requests when requiring each template in a single location. You can check out a basic example implementation of a Templates Module (in the context of Backbone) here.